WMA is a common audio format in Windows which enjoys the equal popularity with MP3 files. Even though you can transfer WMA to iPhone, iPhone can't play WMA files in the Music app. That’s because WMA is not compatible with iOS devices and Mac for some right protection. So you can play your WMA on iPhone with 3rd-party apps or convert them to MP3 while transferring to iPhone. Even though iPhone is a cool and portable device for playing music, it still supports quite a number of audio file types. The device cannot cater for Windows Media Audio (WMA) files as this format is being managed by Apple's biggest viral, Microsoft. You need a professional tool to convert from WMA format to the usual compatible iPhone formats. Most of these WMA files are secured by DRM and most converting tools that are free especially iTunes will fail to convert DRM protected WMA to iPhone, hence iMyFoneTunesMate is a great tool that should be considered. iMyFone TunesMate is an all-in-one iOS file manager which can convert or transfer WMA files to iPhone. It will automatically convert both DRM-protected and DRM free WMA files to formats that are supported by iPhone within a short period of time. Except WMA, TunesMate supports all other audio and video formats. Converting and transferring are done at the same time, which saves you much time. All the incompatible files will be automatically converted while transferring. Syncing iTunes/computer music to iPhone won’t cause any data loss. Extract music from iPhone, which supports both purchases and non-purchases. Sync iPhone with unlimited iTunes libraries without erasing. Manage Playlists: Smartly control your music library like to export, import, add, delete, edit, move music/playlists. Step 1: Open the iMyFone TunesMate app and connect your iPhone to it. Step 2: Go to “Music” tab from the top bar. Click “Add > Add File” and select the WMA files you want to transfer. Click “Open” to begin the process. Please wait for it to finish. Then you can go to the “Music” app on your iPhone to check the song. Just click on it to make it play if you want. Lots of famous review sites recommend iMyFone TunesMate to be the great alternative to iTunes, including getintopc.com, tricksworldzz.com, crunchytricks.com, etc. iTunes helps to convert from WMA to MP3 format and sync the converted files to iPhone. But it’s not recommended as it will cost you much time. You need to add the WMA files to your iTunes library first. Then do as below. Step 1: Open iTunes and go to “iTunes > Preferences” on Mac or “Edit > Preferences” on Windows. Step 2: Tap General and then Import Settings. 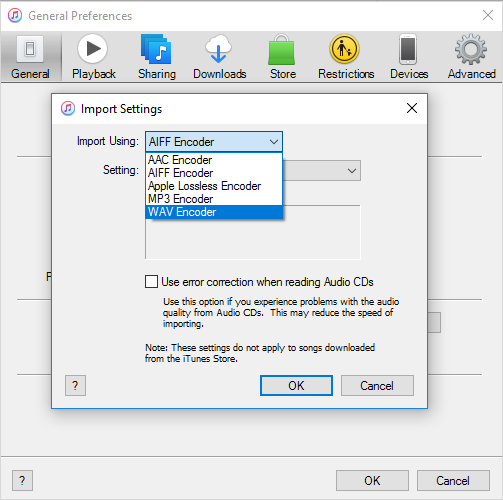 Step 3: Click the box next to Import Using and choose MP3 Encoder. Then click OK to save the changes. 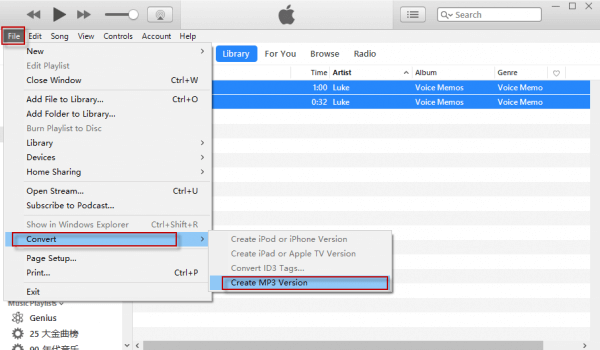 Step 4: On your music library, select the WMA songs you want to convert. Step 5: Go to “File > Convert > Create MP3 Version”. Then the converted songs will be displayed next to the original WMA files. Step 6: Connect your iPhone to computer and click the device tab when detecting. Step 7: Choose Music from the left sidebar. Step 8: Check Sync Music and select the audio files you want to transfer. Step 9: When done, click Apply to start the syncing process. It will take time to sync, wait for it to finish patiently. It cannot be done at one place and in a few clicks. In a way, it’s very complex if you’re not familiar with iTunes. Syncing files to iPhone will delete the existing files from iPhone. If you don’t make it right, all the media files will be erased from iPhone. It does not give you the opportunity to manage the music the way you like. You can’t preview and select the files to sync. If you don’t convert WMA files to MP3 before transferring to iPhone, the only way to play WMA files on iPhone is using third-party player apps. Some audio player apps are compatible with lots of audio formats, including WMA. But the disadvantage is that, you can’t manage or listen to all your songs and listen in one place. It’s would be a little annoyed for some users. If you mind, just convert WMA files to MP3 first.